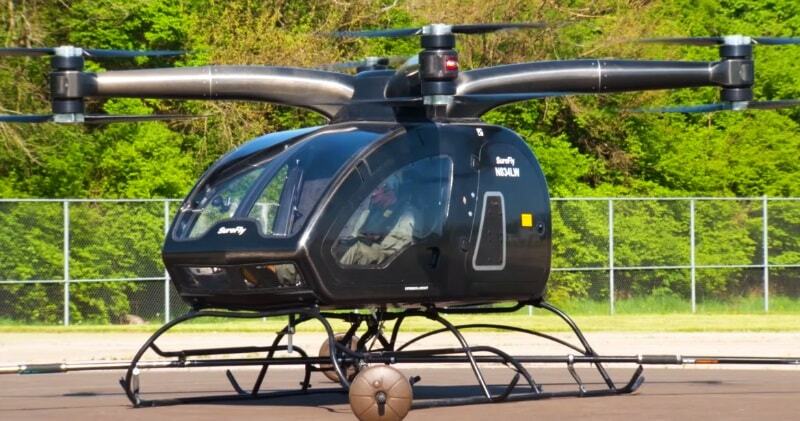 SureFly the personal helicopter/EVTOL aircraft designed for safe and easy flight – completely conceived, designed, built and tested in America by Workhorse – has taken flight, completing its first successful, manned, untethered hover outside of Cincinnati. This video is a progress report of the past few months’ work leading up to lift off.It wasn’t a glamorous flight – it hovered about five feet in the air – but simply getting it off the ground is an achievement in itself. The SureFly vehicle is driven by eight separate propellers, & powered by a hybrid system that combines a gas combustion engine with a parallel battery pack & can carry up to 180 kg over a range of approximately 112 km. The maximum altitude was given as around 4,000 feet.Its motors are all electric, and an on-board generator produces electricity to power them.The SureFly is expected to sell for less than $200,000 each.